Forgiving and Forgetting? A better way to heal relationships! Have you ever been told by your spouse, “You need to forgive and forget.” I have lots of couples come in where one partner reports that the other partner broke their trust and they are not sure how to deal with it. They also say that when they are told they just need to forgive and forget, it does not help. If you have ever tried to forgive and forget, you know it’s hard, if not, impossible. Trust can be broken in many different ways. A little white lie or major infidelity can destroy trust. The intensity of the hurt depends solely on the individual who is on the receiving end of that broken trust. So, can a person really “forgive and forget?” I believe that people can’t forget most hurtful events. The human brain is made to be able to retain information, especially information that has an impact on the person. Yes there are times where information is not retained, such as, when the brain is damaged through physical drama or may when the impacting event is so devastating that the brain cannot process the information produced by the event. Also, there can be other times when a person may not remember something. Also, different types of brain memory play a part in remembering information. Lets discuss this further. To better help understand how memory works lets look at what types of memory a human brain has. First, the human brain has what is called declarative memory (explicit memory). Declarative memory is simply when one is trying to remember something (ie, a name, a list of items, a phone number, etc). Also, the human brain has what is called non-declarative memory (implicit memory). Non-declarative memory involves an involuntary response to something because of what happened in the past. This type of memory happens without your awareness. For example, lets say when you were a child lighting struck your house and now as an adult you shake for no reason when a thunder storm comes. Your brain remembers that lightning strike even though you may have experience many thunder storms without lightning hitting your house since. Declarative memory brakes down into working memory (short term memory) and episodic memory (long term memory). Short term memory is reactionary memory where we remember something that just happened within 2 to 18 seconds after the event. Episodic memory helps a person to remember important events throughout ones life that forms beliefs and thoughts about the world. Also, there is Semantic memory that helps to remember details when something is memorized, such as, math or vocabulary. Non-declarative memory brakes down into primal memory, procedural memory and classical conditioning. Primal memory is helps to remember how to respond to different past events and can make response quicker. Procedural memory is used to helping to learn to drive and do task well. For example, driving a car is tough at first, but after lots of practice, automatic memory takes over and the mechanics to driving help a person to do many of the things required for driving without thinking about it. Classical conditioning is memory that comes about as a person makes associations to other things, whether good or bad, so as to be able to make better choices. So much more can be said about memory to help us understand that remembering or forgetting something may be very complex. Based on what we know so far about memory, many things can interrupt the declarative memory, but non-declarative memory is not well controlled. Is broken trust associated with non-declarative or declarative memory? Broken trust involves cognitive and emotional reactions. It can almost be traumatic, if only minimally. When an emotional reaction is part of the memory process, working memory last longer and episodic memory is triggered the more intense the emotional reaction. Non-declarative memory is not associated with memories of history, except to the point of how one might react the next time the same type of event happens. Therefore, declarative memory, and even more, episodic memory takes over when trust is involved. So now we need to consider how or if a person can forget something. There are several ways that people possibly forget things. Short term memory, decay, displacement and interference can all three be ways someone can forget something. Decay is when a person does not go over information enough to retain it. Displacement is when new memories replace old memories which can be a very positive form of forgetting in hopes of replacing negative memories with positive memories. Interference happens when a person attempts to remember things that are very similar and because they are so similar they can become mixed up. Long term memory appears to have no limit and possibly stores all information. Some theories believe that information lost, may still be stored in the brain, but may be inaccessible. It is still unclear how much someone can actually forget. It does seem clear that a person can forget information by decay and interference that comes from similar memories. 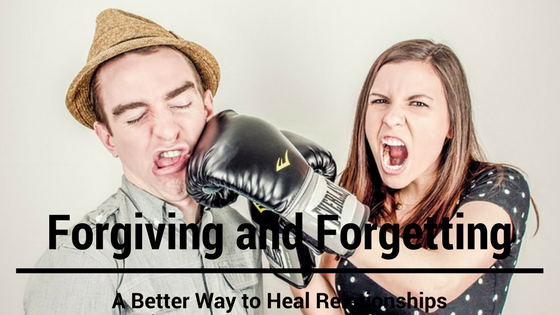 As a marriage counselor I have found a better way to understand that “forgive and forget” debate. I am one to believe and it is confirmed by the information I have shared in the rest of this blog post, memories moments that have a major impact in our lives tend to stick with us. I believe they are hard to get rid of and triggers can bring back up that memory any time that trigger is presented. So, forgetting is not a very useful word when it comes to resolving issues of trust. I have started telling couples to use the phrase, “Forgive and Move Forward.” Why? Well, forgetting is hard, if not impossible, as we have discussed. In the very least, it could take days, weeks, months and sometimes years to heal from a break of trust. Also, when told to “forgive and forget,” it can deepen the hurt of the victim because a tone of “not caring” is displayed in the betrayer, which further affirms that the betrayer broke trust. Many of my clients have enjoyed using the phrase “moving forward.” It appears to give them empowerment to be able to make changes and heal. If you are moving forward, then the person is making progress and being pro-active. Moving forward can involve being intentional, but also helps to dispel the fact that the person will not just “get over” something. It is not and will never be that easy. So, next time you think about telling your spouse to forgive and forget, please stop yourself. Instead, ask how you can help and what can you do as a couple to move forward to heal the relationship. http://brandoncoussenslmft.com/wp-content/uploads/2017/02/Forgiveness.png 315 560 Brand0n http://brandoncoussenslmft.com/wp-content/uploads/2017/01/Logomakr_75Ivqt.png Brand0n2017-02-24 20:56:582017-04-07 17:45:07Forgiving and Forgetting? A better way to heal relationships!